Featured on BBC Radio 3's World Routes and Late Junction earlier this year, Kalia has been described as 'one of the UK's leading world music singers', Wallee McDonald, 2013. She grew up surrounded by folk music on the island of Crete in Greece, and later came to London to study (BMus at the School of Oriental and African Studies, MA Dance Anthropology at the University of Roehampton and DipABRSM Flute Performance). 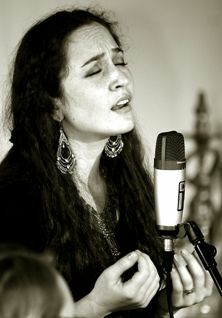 Kalia has also studied a number of vocal and instrumental traditions including Hungarian singing with Marta Sebestyen, Iraqi Maqam with Anwar Abu Dragh, Afghan singing with Hussein Arman, Bulgarian music with Ivan Varimezov, Frame Drums with Zohar Fresco, Nay with Bassam Saba and composition with Ross Daly. With her ensemble she presents traditional music collected from her travels and extensive studies, as well as her own original material. Playing Arabic and Greek/Bulgarian flute (nay, kaval) and singing in a variety of languages such as Greek, Turkish, Arabic, Aramaic, Ladino and Greco, Kalia tells folk tales of love and loss, sorrow and celebration and nostalgia for far-away homelands. Joining her are Jon Banks on kanoun (The Burning Bush, Joglaresa, The Dufay Collective), Vasilis Sarikis on frame-drums, riq, darbuka, cajon and percussion (Natasha Atlas, Shekoyokh, Khyam Allami) and Ruth Goller on double bass (Acoustic Ladyland, Sefiroth, Rokia Traore). The resulting sound is a musical landscape evoking the wild and rugged mountains of Greece and the sunlight of the Mediterranean coast. Apart from performing, Kalia also teaches privately and runs workshops. She has been involved in educational projects at the Barbican, the V&A and The British Museum. She currently teaches Ney at the Yunus Emre Turkish Cultural Centre and is a Woodwinds and World Music tutor for Enfield Music Service.